How long is the average commute to work? It depends on whether or not you live in a city, whether you use public transportation, and which state you’re in. While there may be outliers who blast music while sitting in their cars for hours at a time and those who work remotely, the average commute time to work in the U.S. hovers around half an hour, but there are many different factors that can increase that average to nearly an hour or decrease it to under 16 minutes. What is the average commute to work like in the USA? 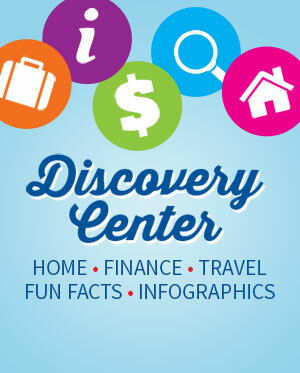 The national average commute time in the U.S. is 26.6 minutes, according to the Census Bureau. That means as a whole, the daily average American commute time is just under an hour, 53.2 minutes, assuming one round trip. 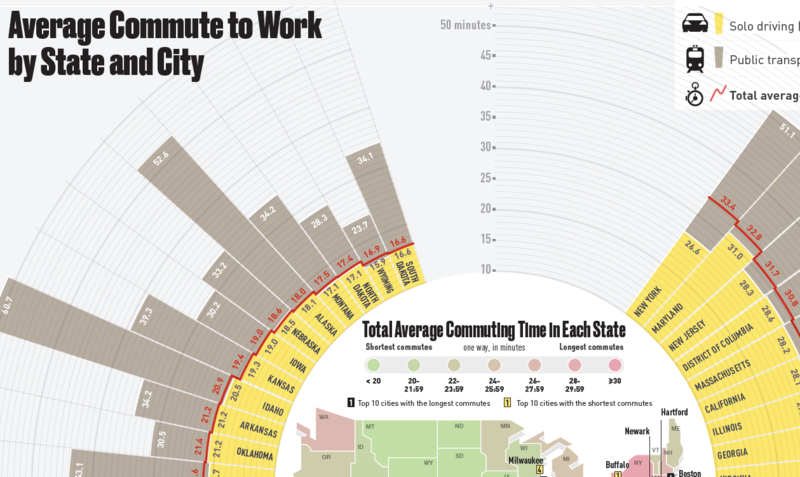 What is the average commute time by city? Perhaps unsurprisingly, New York City has the longest average commute time. Los Angeles, which may experience ridiculous and irregular traffic jams, doesn’t even appear in the top ten. It doesn’t compare, apparently, to nearby Riverside-San Bernardino, CA, which comes in 8th. 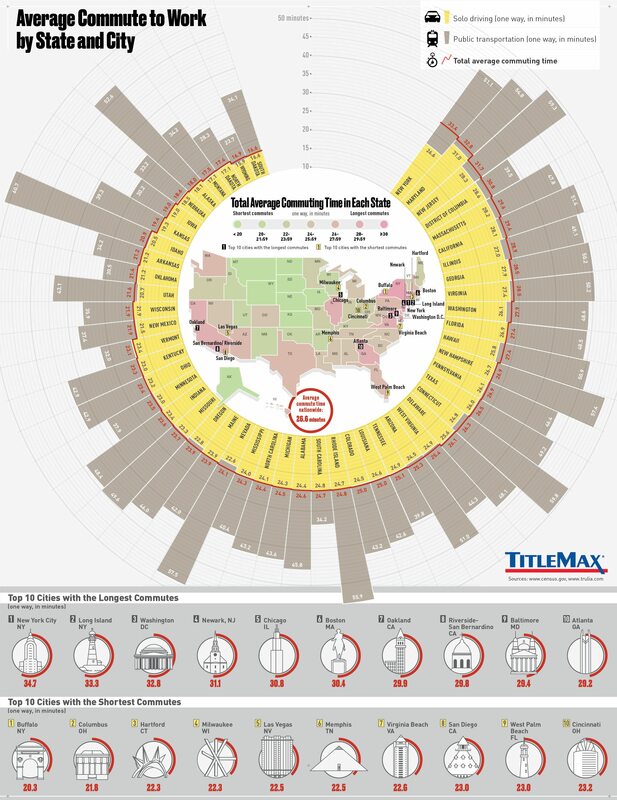 Meanwhile, San Diego is one of the better cities in the US for average work commute time. After NYC regarding the longest average commute times is Long Island, at 33.3 minutes, and Washington, DC, at 32.8 minutes. The cities with the shortest commutes are Buffalo, NY, at 20.3 minutes, and Columbus, OH, at 21.8 minutes. Remember, though, that these commuting time statistics may not reflect instances of extreme traffic in your city, in which everyone may be trapped for much longer. What is the average commute time by state? The best state for commute times is South Dakota, which has an average commute time of only 16.6 minutes. The highest state average is New York, at 33.4 minutes. How does public transportation affect things? What’s really interesting is how the existence and reliability of public transportation affect these average commuting statistics. If you’re driving solo, your numbers are often a fraction of what they would be if you relied only on public transport. If you live in Idaho, your average daily commute is only 20.5 minutes if you’re driving solo, but it jumps to 60.7 minutes if you’re relying on public transportation. For the most part, the average commute if you’re driving solo is a fraction of what it would be with mass transit since most Americans drive themselves to work and few American cities have invested in metro systems like the rest of the world. The exceptions, where how you get to work doesn’t make as much of a difference, are the District of Columbia and New York, likely due to their respective cites. If you’re using these figures as a benchmark for relocation, definitely consider the housing costs and cost of living as well as your commute time. As your commute increases, your car’s mileage will go up more quickly, meaning that you’ll see the cost of car care go up as well as the cost of gas. Also, time lost is money lost, time in which you could be having fun, relaxing, or doing side projects! Shoot for a half-hour commute to work in your area, and always remember to find a place in which public transportation is a reasonable backup.